Pictured above is file photo and does not represent the actual qty, and lengths you will rec. This kit has 14 long studs, 4 medium length, and 16 short studs. This listing is for the sbc head stud kit. We have used this kit on all of our sbc engine buildups, and the fitment is perfect. 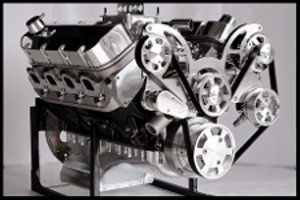 You will receive every stud needed to install both cylinder heads on your engine. For use with most SBC aftermarket aluminum and iron heads, including our Procomp aluminum heads. These head studs are made from aircraft quality 8740 high tensile strength chrome moly steel. 190,000 PSI kit that comes complete with 12 point hex nuts and washers. Very similar or rather identical in design and function to the ARP kits. The best reason for using head studs versus conventional head bolts is that cylinder head studs simply provide better and more consistent cylinder head torque loading. When installed, a bolt must be torqued into place. This creates two forces on the bolt: a twisting motion and a vertical clamping load. But a stud is threaded into place with no clamping load-that comes when the nut is tightened down. Ideally, you only thread the studs finger tight, (or less if needed), in a relaxed state, install the cylinder head, and torque the nuts into place to provide the clamping load. This removes the twisting force from the equation, and the stud will only stretch in a vertical axis instead of stretching and twisting, in the case of a bolt. This provides more accurate and even clamping forces across all the studs. This is also true, in the case of studs over bolts, when securing the main caps. There are also secondary benefits to using studs. First, it makes it easier to properly align the head gasket. It is also easier on the threaded holes in the block because you aren't using the threads in the block to pull the stud into place. If you are using an older block or an aluminum block, this is definitely preferable. Studs are superior to head bolts. And for good reason. Using studs will make it much easier to assemble an engine (especially a racing power plant which must be serviced frequently and quickly!) with the cylinder head and gasket assured of proper alignment. Studs also provide more accurate and consistent torque loading. Here's why. When you use bolts to secure the head, the fastener is actually being "twisted" while it's being torqued to the proper reading. Accordingly, the bolt is reacting to two different forces simultaneously. A stud should be installed in a "relaxed" mode - never crank it in tightly using a jammed nut. You do not necessary have to bottom out the stud when installing if you're short a few threads on the top side. If your stud is screwed into the block approximately 125% deeper than the diameter of the stud, then this is sufficient. If everything is right, the stud should be installed finger tight or less if needed. Then, when applying torque to the nut, the stud will stretch only on the vertical axis. Remember, an undercut shorter stud will have a rate similar to a longer, standard shank stud. This provides a more even clamping force on the head. Because the head gasket will compress upon initial torquing, make sure studs and bolts are re-torqued after the engine has been run. We sell these head stud sets to performance shops all over the country. They are a true pro series head stud set. On a high mileage engine, or a performance engine, it s risky to reuse the original head bolts because the engine may have been torn down several times already. It s much safer to toss the old head bolts and install our new stud set. As the head gets hot, thermal expansion is going to stretch the head bolts even more - especially in engines with aluminum heads. Aluminum expands at more than twice the rate of cast iron, which puts even more strain on the head bolts, and this is one more area that head studs prevail. In a typical engine, just warming the engine up to normal operating temperature may stretch the head bolts as much as .005? or more, another good reason for replacing fatigued head bolts with head studs. Used head bolts have a reduced clamping force. That s a fact. The more the bolt has been used, the less effective it is in clamping down, and is more prone to loosening. Age is also a factor, as time also increases stretch, due to the heat cycles the bolts have encountered. We can tell you this much for sure, a good way to blow a head gasket is to use the old head bolts from your engine. We never do this. Studs are the way to go. Perfect for all aluminum heads Replacing old head bolts is a must when installing new heads. These are the correct length for most any of the bbc aftermarket aluminum heads on the market. We have built at least 20 engines using these head studs. Spending huge amount of money on head bolts is not necessary in our opinion. We use our head stud set on engines that run 13.5 to 1 compression, and never have a problem. Using stock stretched head bolts is the worst thing you can do, especially on aluminum heads. Don t even consider it. When installing aluminum heads on any engine, be sure you run a tap down all cylinder head bolt holes in the block. This ensures that the threads are smooth and clean, which will help give a true torque reading when the head studs are tightened. Some engine builders choose to lubricate the threads of the studs, with 20- or 30-wt. engine oil, or an equivalent thread lubricant before the head studs are torqued. Also, make sure the threads and shanks are clean and free of any foreign matter that may cause false torque readings. Check stud lengths. Make sure you have the correct length for the application and for each hole location (some holes require longer or shorter studs than others). If a stud is too short and only engages a few threads in the block, it may pull the threads out of the block. 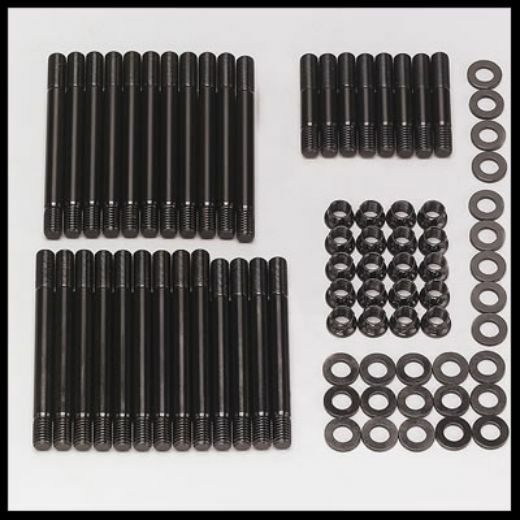 This head stud kit will work with cast iron or aluminum heads. There may be some heads that require a different setup, but any aluminum sbc heads that use the oem length head bolts can use this head stud kit. We use them on all of our engines.